Those are the words of Abraham Lincoln. A wise, humble, and sweet man. Before we chat the quotation, let’s take a little stroll. History has always interested me. And I especially enjoy reading biographies of the men and women who have steered its course. Just before Christmas, my brother plopped a 900-page monster in my lap and invited me to have at it. It was Team of Rivals: The Political Genius of Abraham Lincoln, written by Pulitzer Prize winner Doris Kearns Goodwin. For me, anyway, a great book is one from which you can pick-up all sorts of wonderful things beyond what may have been the author’s intent. And so it is with this “great” book. We’ve discussed temperament, which comes in all flavors (melancholy, anxious, irritable, oppositional, and more) many times here on Chipur. It’s on board at birth and molded by life experience. A man watches his pear-tree day after day, impatient for the ripening of the fruit. Let him attempt to force the process, and he may spoil both fruit and tree. The take-away can be applied to so many situations. But since this is a depression, anxiety, and bipolar disorder education and relief blog, let’s stay in our neck-of-the-woods. Lincoln made that statement in 1863. And the topic of conversation was a proposition included in the Emancipation Proclamation. Specifically, the provision allowing freed slaves to enlist in the armed forces. Lincoln and his advisers knew the provision could lead to some nasty fallout at home and abroad. And some of them suggested he become more aggressive in ascertaining public reaction – even taking to the road to check the public pulse. But Lincoln knew it was best to hunker down for a while and patiently wait for public reaction to evolve – and come to him. And that couldn’t have been easy, given how close to his heart the Emancipation Proclamation was. Lincoln’s words speak volumes of wisdom to anyone enduring difficult and trying times. As much as we may want to force the process of healing, it’s most often best to allow things to run their natural course. Does accepting that smidge of reality equate to accepting prolonged pain, desperation, and hopelessness? ‘Fraid so. But with the stakes so high, don’t we need to make sure we’re getting the job done right? I sure think so. Okay, I can’t resist. How ‘bout one more quick Lincoln story and quotation? In the early 1840s, Lincoln was at his melancholy worse. This combination of events tore him apart: his closest friend Joshua Speed announced he was leaving Springfield (Illinois) for his family home in Kentucky, he’d dissolved his engagement to Mary Todd, and a troubling legislative issue that threatened his reputation. Lincoln was behaving erratically and became suicidal. Those closest to him were frightened. Twenty years later, Speed visited Lincoln at the White House. It was shortly after he’d signed the Emancipation Proclamation. Do you see why I enjoy reading the biographies of great men and women? Are you troubled, and so desperately seeking relief and healing that you’re about to fast-lane yourself out of both? Remember the lesson of Abraham Lincoln’s pear-tree, okay? 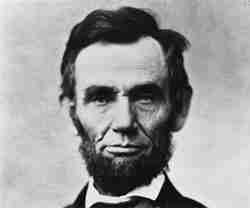 And never forget Lincoln’s melancholy, and the greatness he was able to achieve. No reason why you can’t, as well.